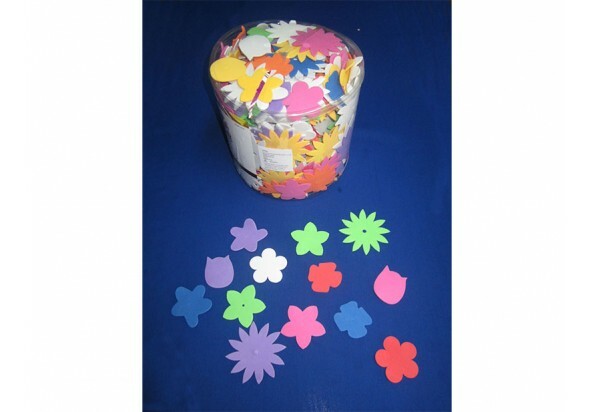 EVA Foam Flower Bucket 1/2 Lb Toys (AC884)-Foam toy-台州山水工艺有限公司官网,山水工艺,台州山水工艺,仙居山水,台州山水,Taizhou Mountain & River Art and Crafts Co.Ltd,Registered and established in 2006, Taizhou Mountain and River Crafts Co., Ltd is a storage trading company, also is the only one Sino-U.S. joint venture in Xianju County, which was jointly set up by the U.S.-based S&S Worldwide and Xianju Yikai Crafts Co., Ltd. Foam flowers for festive displays! 1)Approx. 360 in assorted colors. 2)Use in lots of craft projects. 4)Add chenille stems and make a Bouquet! Non-adhesive. Assorted sizes. 1/2 lb. Decorating materials sold separately. We add ribbons and buttons and put them on dog collars. I use these for bird toys parts to add color, variety and uniqueness to toys. Great for the birds that love soft things, and preeners.